Soho Data Center Small Office Home Office Hosting Solution. Soho Hosting offers you Speed, Reliability, and backed up with our state-of-the-art network data center located in London's Docklands Telehouse. The UK's leading neutral co-location facility and is home to Europe's main Internet hubs. With all major Internet backbones on site, bandwidth can be provided independently of teleco fibre and the associated costs. 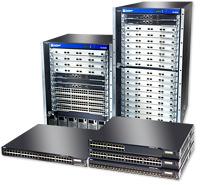 Our network uses the latest Juniper routing and HP switching systems. This gives us maximum speed and reliability to ensure the best service possible. We have backups of all major hardware which is kept ready in the event of a hardware failure. Hardware is also updated over time to make sure we are taking full advantage of the best equipment possible. Our connectivity is provided by a number of leading UK providers. We use BGP routing to enable us to use all our connections to get maximum performance. This also gives us 100% uptime as even if one if our lines fails there are at least two others which takeover instantly. All our systems are covered by APC UPS back up systems for instant backup in the event of a power failure. With a diesel backup generator which provides power for prolonged power failures Our data centre is built to an N+1 standard so this means that if two generators are required to provide non-stop power, then there'll be three installed. So rather than guaranteeing 99.99% availability, the guarantee is 100%. When it comes to security, we refuse to compromise. Our data centre features totally comprehensive 24/7 security to keep your data 100% safe. This means our customers have the protection of security barriers, 24x7x365 monitoring by on-site personnel to include visual verification of all personel entering the building, CCTV video camera surveillance and a security breach alarm provides the control room with information. Very Early Smoke Detection apparatus is installed. These highly sensitive aspirating smoke detectors are linked to the Building Management system which is monitored continually from a network operations centre; provide very early detection to help avoid fire, loss and business disruption. This is coupled with a gas based fire retardant that is environmentally friendly, to put out fires instantly, without damaging equipment. We take great care in selecting the hardware used in our servers to enable us to have maximum reliability and performance.